Want to make leaps and bounds in your mountain bike performance? Maximize your training time with specific cycling workouts on your road bike. With a structured progressively planned training program – you will experience surprise-yourself, successful results. Road cycling is key – it allows the athlete to entirely focus on honing an efficient smooth pedal stroke, while also training the specific physiological system without experiencing the wear and tear of riding the dirt. The first step to achieve an efficient pedal stroke is a properly fitting bike. Bike fittings available through o2fitness. In order to experience improvements and benefits from your training, it must be structured. It is pivotal that the athlete understand the purpose of each workout and how it relates to the athlete achieving his/her individual performance goal. Attacking each and every workout, whether rest or intensity, with understanding and intention, is an essential step toward success. 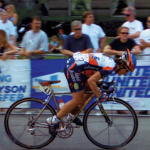 Another element to success is the inclusion of a range of workouts that train the pertinent (determined by each individual athletes past and present training and future goals) physiological systems while improving pedal technique and efficiency – speed skills, tempo and sub/lactate threshold intervals, specific strength, endurance and rest. Speed skills – are short sharp 100% efforts, or rate of perceived exertion (rpe) on a scale 1-10 (1 easiest, 10 max effort) is 9-10, which hone economy of movement and neuromuscular response, ultimately improving pedal technique. Sub Lactate and Lactate intervals – Sub LT intervals are performed 6-8 heart beats below LT and provide similar benefits to pure LT intervals, yet do not severely tax the system, resulting in less recovery time. Sub LT intervals further improve muscular endurance and increase lactate threshold power and pace. LT intervals, rpe = 7-8, improve the athlete’s ability to process lactic build-up around the working muscles, improving tolerance for accumulating acid. This interval training also extends a valuable mental benefit – ability to maintain focus on pedaling form while riding through discomfort. Specific Strength workouts, also known as Slow Frequency Repetitions (SFR) – performed on 4-6% gradient, in a big gear to create low cadence, ie 40-60rpm and high resistance. The goal is pedal strength and technique, it is not a max cardio effort – rate of perceived exertion is 5-6. This workout focuses on perfect pedaling – engage quads pushing over the top, focus on hamstrings and glutes to scrape the pedal back on the bottom of pedal stroke, and actively unload pedal upward. Warm-up with single leg drills – which provide insights into weak points on each leg’s pedal stroke and provide the focus for strength workout. Complete workout with 10-20 min high cadence, 100 plus rpm – to spin the legs out – which will help alleviate the heaviness (this workout has a similar effect to lifting weights) in legs produced by big gear workout. This is a highly beneficial workout when performed consistently and progressively. Long Endurance – performed on mountain bike to sharpen handling skills. This workout demands discipline in staying in the prescribed low zone 1-2, or rpe 3-4. It must be emphasized and re-emphasized to the athlete – that all workouts must be respected and performed in prescribed zone/or rpe. The tendency of endurance athletes is to do all workouts at middle intensities – long endurance and rest days are performed at too hard of a pace, and interval days are not performed with sufficient intensity – resulting in mediocre performances. Long endurance maintains basic endurance, while training the body to efficiently utilize fuels – sticking with fat stores before prematurely jumping over to finite carbohydrate stores. Disregarding training in this zone is the greatest culprit of the bonk. Diligence in training in these zones, trains the body to utilize fat stores for fuel longer into high intensity efforts. At high intensities – the body switches to carbohydrates for quick energy. Active recovery and rest – active recovery – zone 1 or rpe 1-2 is light activity which facilitates flushing blood flow, nutrients and oxygen, improving recovery post intense workout. Rest days, complete days off, are mentally and physically invaluable for total regeneration and recuperation, and allow the body to rebuild and make strength gains. It is essential to be mentally and physically fresh in order to attack workouts with intention and intensity. An athlete’s history, present fitness and future goals combine to determine the individualized systematic workout plan. Below is a sample training scenario for an intermediate/advance athlete. Workout plan – tailored to the individual and formatted in four week blocks – first three weeks progressively build in volume and duration of interval times. Each block has a soup du jour – the focused system, tempo, lactate, etc. The fourth week is mental and physical rest. Base period – riding long endurance miles and during this one to three month period, also include mainstay elements of one to two days of speed skills and 1-2 days of SFRs. Following this base period, which builds muscular endurance, specific cycling strength and cardio engine, it is time to up the ante and include one to two, four week blocks of tempo (rpe = 5-6) intervals. Start with 3x10min, two sessions per week, one on rolling to flat terrain with higher cadence and one on climbs, more resistance, lower cadence to gain strength. Both sessions present opportunities to hone pedal efficiencies at different rpms. Increase duration of interval by two to five minutes every one to two weeks, up to 3-8 reps, with total interval time of 90min. During this one to two block period continue to include speed skills, SFRs, long endurance days, and two rest days/week. During the next four week block of training, ramp up the intervals to SubLactate Threshold, 6-8 beats below individual’s determined Lactate Threshold. Intervals will progress from 6 to 12 min for a total interval time of 30-60 min. Again it is beneficial during this block to perform two sessions/week one on flat to rolling terrain and the other on climbs. Usual suspects of speed skills, SFR, long endurance and rest days continue to play a role. Finally – we crescendo with pure LT intervals – the punctuation and point to our training pyramid. Start with 3x4min and every 1-2 weeks increase interval time by 1-2 minutes, up to a max of 10 minutes. Build from 2-6 reps. Two sessions per week – one flat/rolling and one on climbs is ideal. Continue to include – speed skills, SFR, long endurance and rest. The timing of base prep and block training is determined by the individual athlete’s goal event. Complete the cycling workouts with a cycling trunk stability/core strength workouts three/week, and post ride stretching regiment. A consistent weekly practice of yoga and pilates is instrumental in maintaining body awareness, maximizing proper biomechanics, efficient flexibility, and a safety net for injury prevention. These extra-curriculars coupled with systematic training and a properly fitting bike are essential to maximize your workout investment, achieve optimal pedaling technique and grab your goals.